The Bush-shrikes are an interesting group of colorful and often secretive species, bearing shrike-like bills, restricted to sub-Saharan Africa. One widespread example is the Brubru (left). It is a small bush-shrike placed in its own genus (Nilaus); more about it below. Bush-shrikes are closely related to Helmet-Shrikes (Prionopidae), Vangas (Vangidae), and the Batises & Wattle-eyes (Platysteiridae). Indeed, most of the older literature lumps this group with one or more of these families. It was once thought they were also closely related to true Shrikes (Laniidae), but more recent biochemical research (e.g., Barker et al. 2004) shows that while they are both in the huge Corvoid assemblage, they are not really that closely related (a bit more on taxonomy below). The actual relationships between all these groups has recently received some resolution (Fuchs et al. 2004). Many bush-shrikes have loud and characteristic vocalizations, but can be difficult to see. The Gray-headed Bush-Shrike (right) is in this set. Even in this shot it is screened by branches and leaves, but perhaps you can get a feeling of the big hooked bill and colorful orangey-yellow underparts. It is a large bush-shrike in the genus Malaconotus, which has six rather little-known species. Four of this genus are rare and range-restricted montane species [Lagden's M. lagdeni, Green-breasted M. gladiator, Monteiro's M. monteiri, and Uluguru M. alius]. Quite a few of the bush-shrikes are undergrowth skulkers, hard to observe but strongly vocal. These include the Telophorus bushshrikes (a number of which are also montane specialists, including the endangered Mt. Kupe Bush-Shrike T. kupeensis that could actually belong to its own genus), and the Laniarius gonoleks and boubous. There is still much confusion about which species is in which genera; I use the proposals of Fuchs et al. (2004) here. While boubous are dressed in various combinations of black, gray, and white, the gonoleks are truly spectacular. It is difficult to spot these denizens of thickets or other dense vegetation, but the effort can result in a very rewarding experience. Amazingly, the Crimson-breasted Gonolek (below) that I photographed at Mata Mata Camp in the Kalahari-Gemsbok Nat'l Park, South Africa, had gotten used to people, and almost walked across my foot as it came to a water drip! It is a startlingly gorgeous bird in this vast expanse of Kalahari desert. Because the gonoleks and forest-dwelling bush-shrikes are challenges just to see, I was particularly pleased with my photographic opportunities during our quick-paced Uganda trip in 2002. I 'cut-and-paste' this quartet from the Uganda trip report: "With the help of a local guide, or Rita, or Hassan Mutebi playing tapes, I was able to photograph, for example, these four usually secretive bush-shrikes:"
These are Luhder's Bush-Shrike (upper left), Doherty's Bush-Shrike (upper right), Black-headed Gonolek (lower left), and Papyrus Gonolek (lower right). The latter shot shows two adults dueting with a youngster peaking in from the back side. A unique dry-country species is the Rosy-patched Bush-Shrike (left) of east Africa. It is found in decidedly terrestrial pairs, running rapidly between the thorn-scrub bushes. Males (like this one) call and display from bushtops. Although males have rosy throats, the bird is named for its rosy rump patch, best seen in flight. It has been traditionally placed in its own genus (Rhodophoneus) but the newest biochemical research shows that it is not a distinct evolutionary branch, and it is now recommended to be included among the Telophorus bush-shrikes (Fuchs et al. 2004). Other impressive skulkers are included in this genus, including one with the enticing name Gorgeous (or Four-colored) Bush-Shrike Telophorus quadricolor. Another colorful genus is Chlorophoneus, which includes the Many-colored Bush-Shrike C. multicolor. All are beautiful when seen but are incredibly hard to locate in the dense thickets they inhabit. Characteristic calls help, but even tapes don't always bring them in. The South African species goes by the Afrikaner name of Bokmakierie (below); it is more often heard than seen in the thornveld. This one perched briefly at the top of dense thorn tree. Additional groups in this family are the puffbacks and the tchagras. Each is special in its own way. The puffbacks are not hard to see — most species forage in open the canopies of bushes or short trees, often with mixed species flocks — but they are named from the loose feathers on the male's rump and lower back. A male Black-backed Puffback (left; the bird is some distance away but in full display) puffs out the white rump feathers "to form a remarkable white ball, then bows, droops vibrating wings, and spreads tail. He makes short 'butterfly' flights with the puff expanded, and may drop vertically through the air with raised wings. Courting birds audibly click their wings" (Zimmerman et al 1996). The tchagras are thicket dwellers, though they can readily be enticed to the scrub edge. There are four species in the genus Tchagra, and the widespread examples are birds of dry thorn-forest, like the Brown-crowned Tchagra (below in a fine photo by Ed Harper). It can be a challenge to distinguish between the various tchagras unless good views are obtained; all have head patterns reminding me of large versions of the Worm-eating Warbler Helmitheros vermivorus in North America. Some of the boubous (pronounced "boo-boo" so its a fun word to say) are pied black-and-white like puffbacks, but they are undergrowth skulkers best located by loud fluty calls, males and females dueting to each other. A widespread example is Tropical Boubou (right in another photo by Ed Harper). Others are all black, clambering around in thickets and reminding me of black male antshrikes of several species in the Neotropics. A common example is Slate-colored Boubou (below). Brubru (right; trying to deal with a large worm captured in the canopy) has a tangled taxonomic history, and was at one time variously placed with the shrikes [Laniidae], bush-shrikes [Malaconotidae], helmet-shrikes [Prionopidae], or Old World Flycatchers [Muscicapidae]. "Its batis-like plumage, helmet-shrike-like tarsal scutellation and nest, and true shrike-like bill, juvenal plumage and behavior have fueled the debate" (Harris & Franklin 2000). Fortunately, that debate is now over as Fuchs et al. (2004) show it is firmly within the Bush-Shrike family. The final member is Blackcap Bush-Shrike Bocagia minuta, sometimes called the Marsh Tchagra. It hides in rank vegetation and reedbeds of swamps in west and central Africa. Harris & Franklin (2000) retained it in a monotypic genus as it differs from Tchagra in a variety of ways: it is sexually dimorphic, and differs in eye color, tail color, communication behavior, and nest decoration. However, the preliminary biochemical work shows it is close to Tchagra (Fuchs et al. 2004) and may prove in the future to better fit in that genus. Photos: Both photos of Brubru Nilaus afer were taken in Augrabies Falls Nat'l Park, South Africa, in July 2005. The Gray-headed Bush-Shrike Malaconotus blanchoti was in Kruger Nat'l Park, South Africa, in July 1996. The Crimson-breasted Gonolek Malaconotus blanchoti was at Mata Mata Camp in Kalahari-Gemsbok Nat'l Park, South Africa, in July 2005. The Uganda quarter were from July 2002: Luhder's Bush-Shrike Laniarius luehderi from Ruhiza in Bwindi-Impenetrable Forest Nat'l Park, Doherty's Bush-Shrike Telophorus dohertyi was also at Ruhiza, Black-headed Gonolek Laniarius erythrogaster from Queen Eliz. II Nat'l Park,, and Papyrus Gonolek L. mufumbiri in papyrus lining the Kazinga Channel. The Rosy-patched Bush-Shrike Telophorus cruentus was photographed in Tsavo West Nat'l Park, Kenya, in Nov 1981. This male with a black-bordered throat patch is clearly of the race cathemagmena which occurs south of the Equator; I also have photos of the race hilgerti from Samburu park, north of the equator, whose rosy throat is more extensive and not bordered with anything at all. The two races do not intergrade (emergent species?). The Bokmakierie Chlorophoneus zeylonus. The Black-backed Puffback Dryocscopus cubla in distant display was also in Kruger park in July 1996. 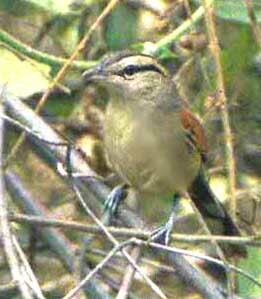 The Brown-crowned Tchagra Tchagra australis was shot by W. Ed Harper in Kruger Nat'l Park, South Africa, near the Mozambique border, in July 1996. W. Ed Harper also photographed the Tropical Boubou Laniarius aethiopicus, this one at "The Ark," Kenya, in July 1994 (I have poorer photos of the southern race which is washed with pale cinnamon below). The Slate-colored Boubou L. funebris was in Samburu Nat'l Park, Kenya, in Nov 1981. All photos © 2005 D. Roberson except the photo © W. Ed Harper 2005 and attributed to him; all rights reserved. Keith, S., E. K. Urban, and C. H. Fry, eds. 1992. The Birds of Africa. Vol. 4. Academic Press, London. Traylor, M. A. 1986. "Platysteiridea," "Muscicapidae," et al. in Check-list of Birds of the World (E. Mayr & G. W. Cotrell, eds). Vol. 11. Harvard Univ. Press, Cambridge, MA.